Our group is very democratic and friendly with all members contributing to the programme, helping each other and sharing their expertise and equipment. My job as group leader is to hold the group together, bring new ideas into the group, to encourage members to submit their ideas and to liaise with U3A headquarters. We have given displays at both AGM and New Members meetings and a yearly Christmas exhibition for church members. Basically as our name suggests we paint and draw. Programmes over the last year have covered drawing, with both pencil and charcoal, drawing from a live model [one of the group], picture making from photographs. We have been painting with acrylics and watercolours, and using soft pastels. For two weeks we explored the use of ink and bleach – basically painting with bleach on a prepared paper painted with ink. Watercolours under the ink gave some very interesting results. Topics have included landscapes focusing on different aspects, skies, water, snow etc, also portraits and action pictures. Members are encouraged to submit and introduce topics. Last summer some members went up to the Danish Camp to paint. Members come with a range of experience and abilities, some having previously attended classes, some not having painted since school days. All are welcome, there is always someone in the group ready to help. Enthusiasm and a love of painting is all required. 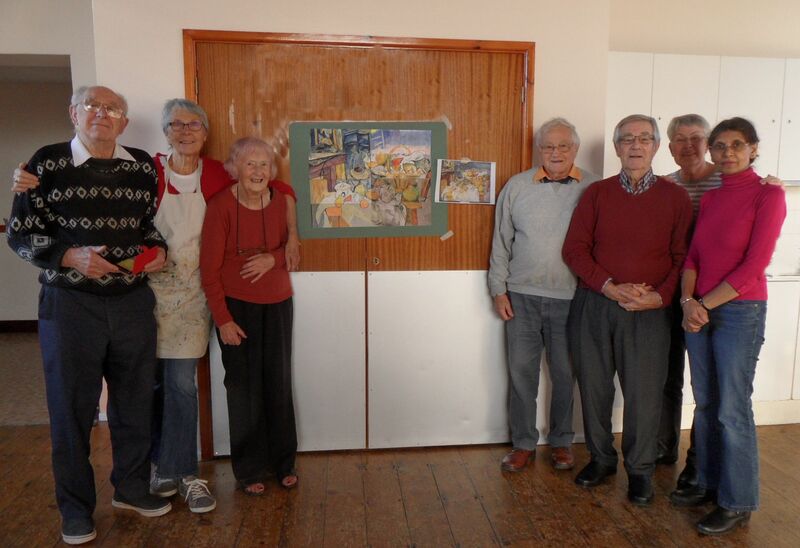 Members have their own basic painting and drawing materials [according to their preferred way of working] but we also share around – so there is no need for any new members to rush into buying materials. A few ‘good paints’ are far better [i.e. give better results] than a lot of cheaper ones. Last year we did a Group Picture – see photo. 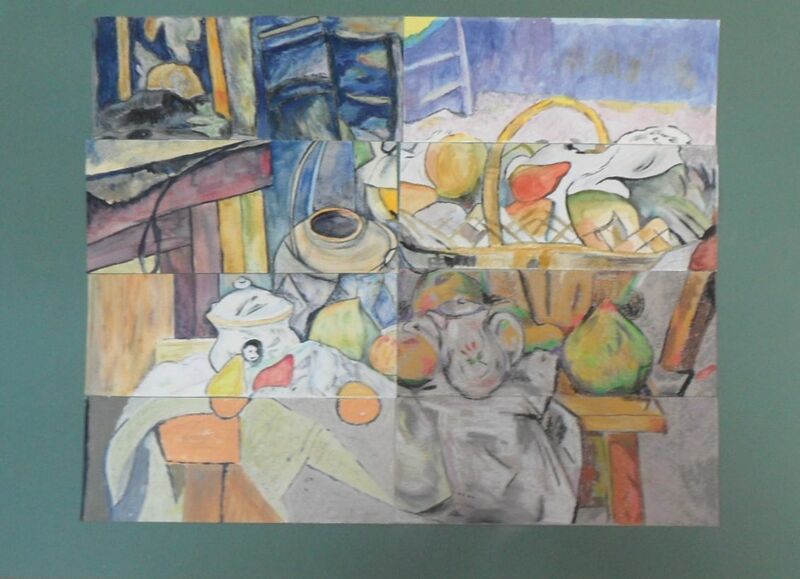 The group chose a still life by Cézanne, This was cut it into 8 equal pieces [there were 8 members at that time, now there are 11 members]; each piece was then enlarged, with members painting one section each. These were then put back together to make an enlarged picture. A variety of media was used in the painting and the pieces all fitted well together. Next term we will be doing something similar.